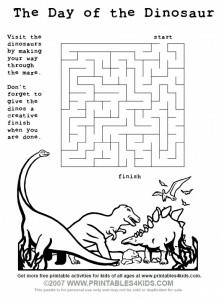 Make your way through the maze to find the dinosaurs then color the scene with our Dinosaur Maze and Coloring Page. This is the perfect supplemental activity for a dinosaur birthday party, scout troop activity or desk work in the classroom! Want more dinosaur fun? Try your skills with our Dinosaur Word Search or print out your favorite of our 12 Silly Dinosaurs coloring pages, too. really enjoy the wonderful activities that this site has to offer. The children in my class varies from preschool to the second grade so this site is the one for me.